This week’s Profile is on Tommy Tudehope, a Sydney based social media consultant who has a great appreciation for tailor made goods. It aims to showcase how special attention to detail can bring ones personal style to a whole new level. 1. My navy suit is a staple in my wardrobe. It is far more versatile than a black or grey suit and I can easily mix and match it with other combinations. With this particular suit, made by Patrick Johnson, I was after something lightweight that could easily be worn on hot summer days but also in winter with an overcoat or vest. 2. This suit in a “Prince of Wales check” is a much heavier woollen cloth that is well suited to the cooler winter months. 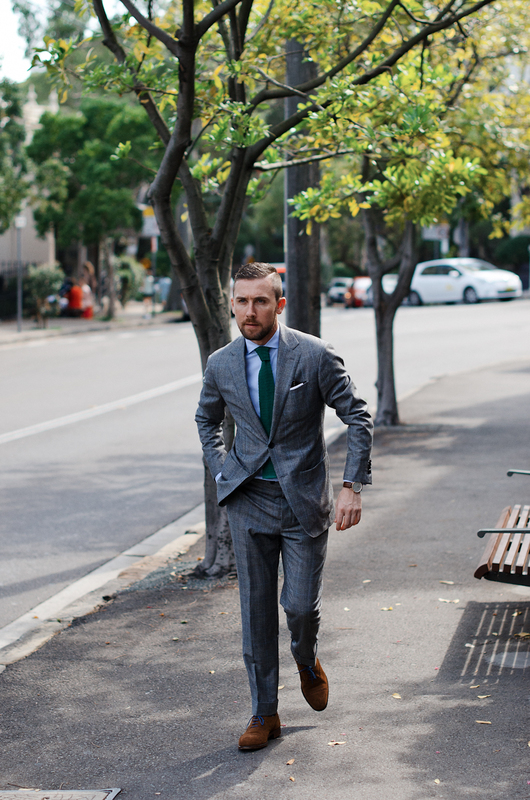 However, given that the suit is unlined the fabric breathes easily on warmer days and avoids that body hugging look. I rarely wear black shoes, much preferring the versatility of varying shades of brown in suede and leather. I like how the blue laces on my Crocket and Jones bring out the subtle blue line running through the checks. 3. My coat made by Patrick Johnson is probably my favourite made to measure piece in my wardrobe. The cloth is a gun check wool and is particularly bold when matched with an orange or brown tie. Sports coats aren't usually considered a young man’s go-to item but they area a great way to alter the look of your suits and experiment with different features like lapels and pocket styles. Fashion credits: Suits all made to measure by Patrick Johnson. Ties by Drakes for P. Johnson. Shirts made to measure by Peter Lee in Hong Kong. Ray Bans sunglasses. Daniel Wellington watch. Pocket Square by Drakes. Crockett & Jones suede shoes with Incu laces and Meermin Tassel Loafers (from Spain).